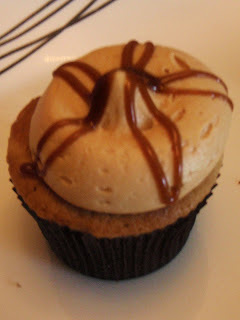 When we were on our way to VA for the cake show we decided to stop in Georgetown to try a certain cupcake place. We placed our order ahead of time so that we wouldn't have to wait. Which I highly recommend everyone do. So I thought I would give a little review of what Jason and I thought of the cupcakes. The store is super cute, but really packed with all the people inside. There was barely room to move around. Here is the line to get in. It actually wasn't to bad considering we had seen it before last year, and it was wrapped around the building. Plus it was raining so I guess people don't like to stand in the rain. So we decided on half a dozen cupcakes. The cupcakes are $2.50 a cupcake which I think is totally reasonable. We selected two salted caramel, one vanilla squared, one vanilla & chocolate, one coconut, and one cherry blossom. Each cupcake had a cute little design on it and the signature swirl. First up was the salted caramel. We decided to get two of these since we both like that flavor. The frosting was very good, and not to salty. The cake looked as though it had been drizzled with caramel. The cupcake had no filling but was fluffy and moist. This was by far the best cupcake of the bunch. 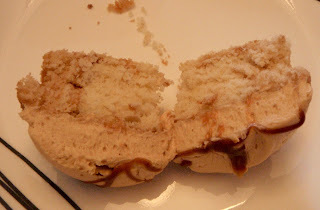 It was also the best salted caramel that we have had from any bakery. Next up we had the vanilla & chocolate. This cupcake is described as a Madagascar bourbon vanilla cupcake with a whipped Callebaut chocolate frosting. We did not care for this cupcake. 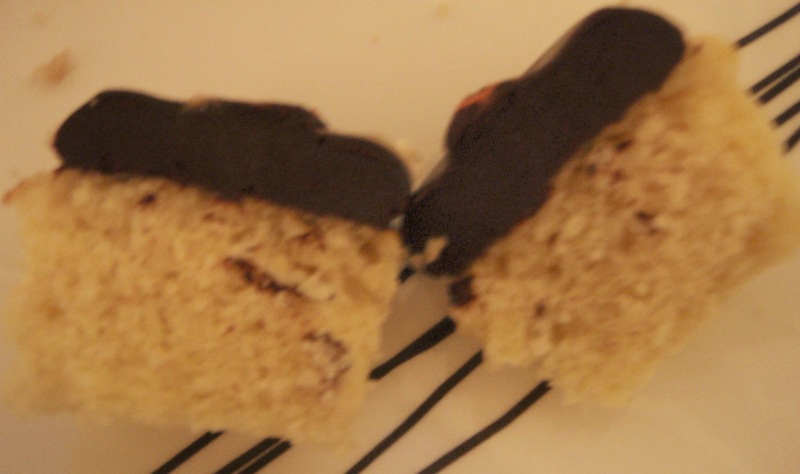 The cake was not super moist, although I would not describe it as dry, and the chocolate icing was not our favorite. 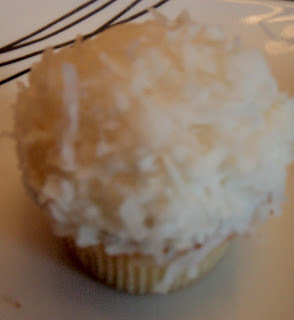 Next, up I tried the coconut cupcake which is coconut cake with vanilla cream cheese frosting. 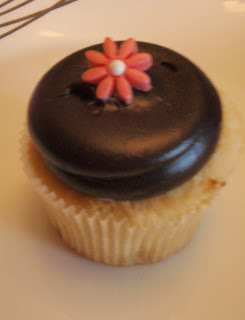 I was really excited to try this cupcake because coconut cake is one of my favorite cakes. 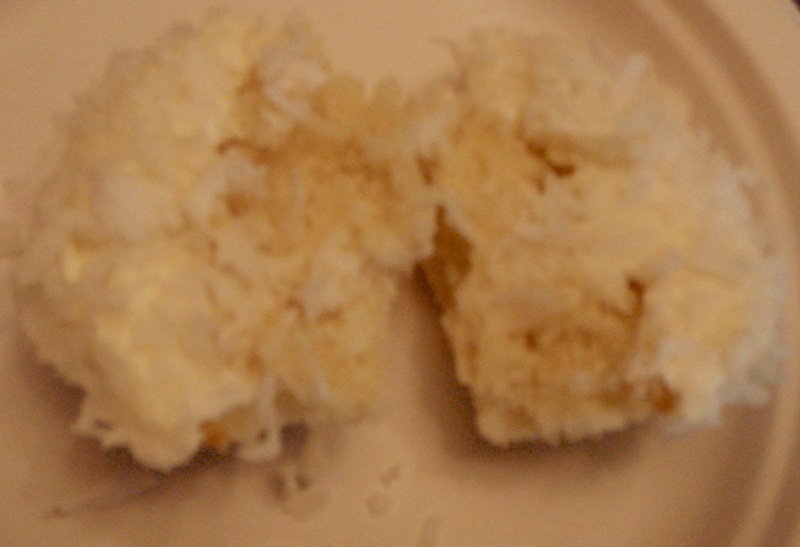 The cake itself was moist with shredded coconut baked into it. Yum! The cream cheese icing however fell short for me. 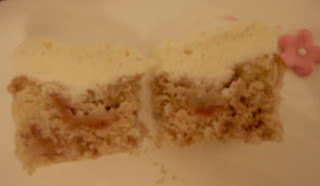 I did not like the cream cheese icing paired with the coconut. 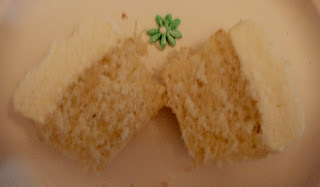 with a vanilla cream cheese frosting. 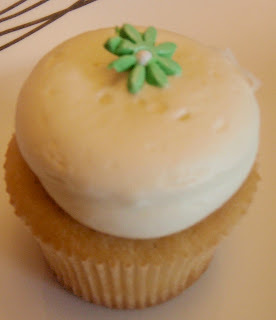 Again, I did not care for the cream cheese icing on this cupcake. I think that the icing was a bit to sour and slightly gritty. The cake itself was slightly dry as well. This one was not a winner for us. 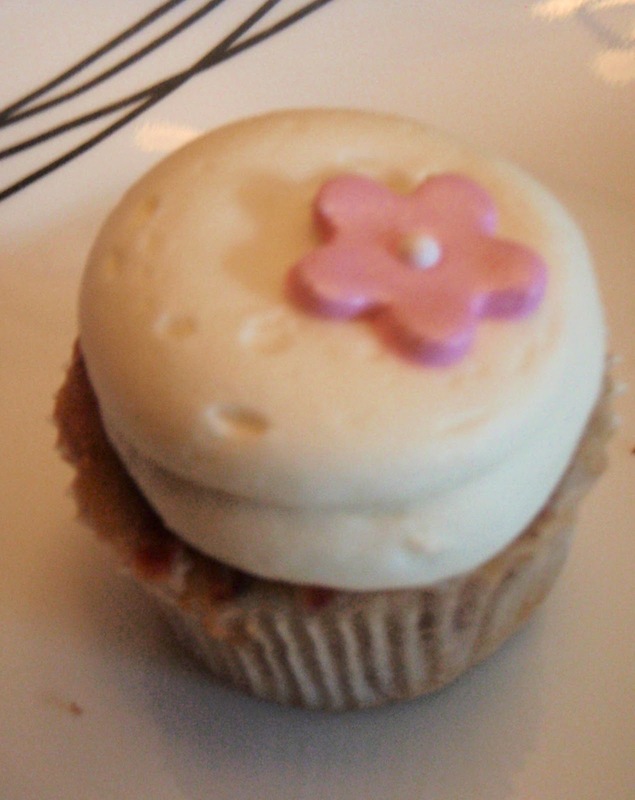 Last up was the cherry blossom cupcake which is one of their seasonal flavors. The cupcake is a Madagascar bourbon vanilla cupcake baked with fresh cherries and topped with a vanilla cream cheese frosting. Now even though this cupcake was frosted with the cream cheese icing, which had been a miss for me prior, this icing was very tasty. Jason did not like the fresh cherries in the cupcake, but I did not mind them. Overall, I think this cupcake was a winner. Overall, it was fun to taste test each cupcake. I think that it we are in the area next year I would like to try their regular vanilla buttercream instead of their cream cheese icing. The salted caramel was definitely the winner out of the batch. Stay tuned next week when I will give a review of Sprinkles cupcakes. I think I would prefer the cherry one.